We ran another overnight trip back down to the Washington Canyon yesterday where we have been fishing almost all of August and September. We fished a few miles south of where we fished a few days on ago on our last trip and found the tuna more than willing to eat our chunks almost nonstop. We ended up going 25 for 35 on decent size Yellowfins with about 40-50 bites overall plus we released a small Mako. 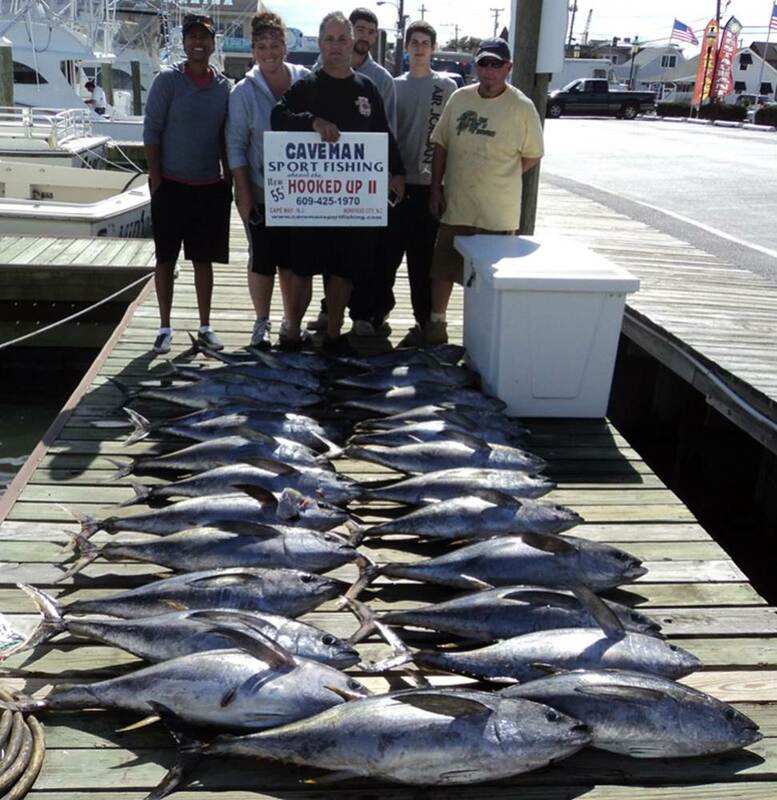 I think it is safe to say the Washington Canyon is still on fire when it comes to catching Yellowfin tuna. On this trip we concentrated more on catching our limit of Yellowfins chunking versus trolling for Big Eyes so our string of 8 straight trips with at least one Big Eye was broken but the action on Yellowfins more than made up for not spend time trolling. The charter was from a cruise boat in Philadelphia named the Ben Franklin. Capt Lucky himself ( Ed V from Havertown, PA) who owns the cruise boat booked the trip for his employees. They had Tom from Swarthmore, PA, Christy from Philly, PA, Nick from Havertown, PA, Frank from Philly, PA and Leg from Philly, PA all were Capt Lucky’s guests on the trip. We have most of October open at this time for regular canyon charters for those that might want to get in on this fabulous fishing. We will be offering make-up canyon trips for small parties and singles starting as soon as we get a weather window so contact us if you are interested in loading up on tuna before the season comes to a close. 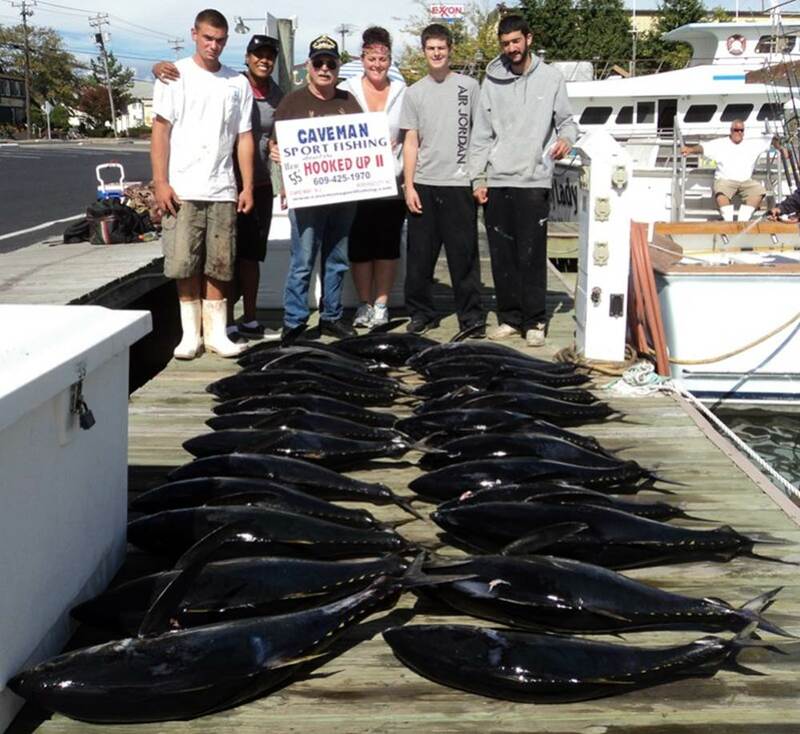 We plan to offshore fish until at least the end of October or even later depending on if the tuna are within range of our home port in Cape May, NJ and we get weather that will allow us to get offshore.